A few weeks ago we took a little road trip to Fargo, North Dakota to pick up our first batch of homegrown yarn! The boys were super excited, as road trips always mean pizza on the bed, hotel pools and ice machines! This kind of road-trip was equally as exciting for me because - well YARN! I had to search quite a while for a place to process my fibre, there are no mills in Manitoba or Saskatchewan, and shipping fees to other Provinces can be quite exorbitant. Thankfully, I was able to send the fleece down south in the summer and a few months later I recieved the call that it was ready! We arrived at the Dakota Fiber Mill and were greeted by Chris, owner of the mill and one of the greatest fibre folk I have ever met, and her 7+ foot tall camel - staring out at us around the barn! I have never seen a camel this close, and we were all awe-struck. He was so gentle, and quiet, and it seemed as though his big huge eyes were all knowing. I seriously think Luke is trolling kijiji and local livestock pages for listings of camels. Chris brushes this guy once a year, and she said it takes about a week to fully brush him. She then spins his fibre with a blend of wool and/or alpaca. I bought of skein of this yarn and it's beautiful! 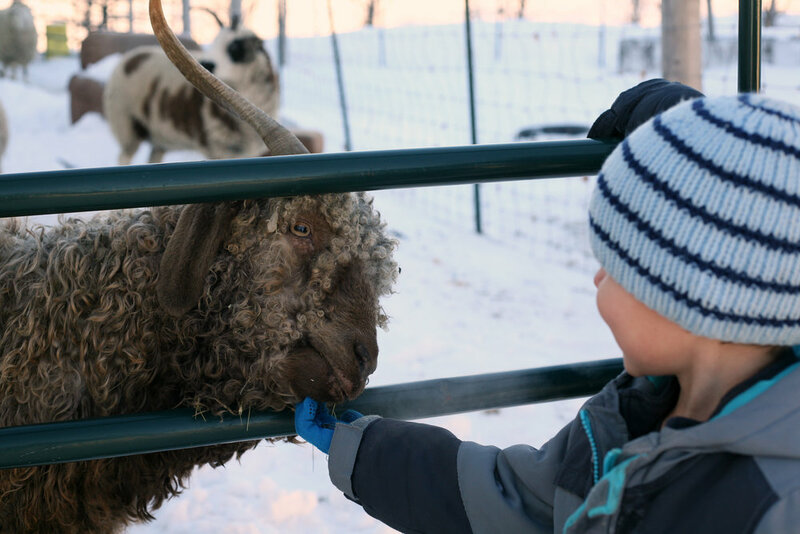 Chris has a mixed flock and herd of other fibre animals including alpacas, angora goats, jacob sheep, cotswald, and angora bunnies! All her animals are friendly and you can tell they are well taken care of and produce beautiful fibre. Chris gave us a tour of her wool mill and also the small retail shop attached. It was such an informative, lovely tour, and helped me understand wool processing on a new level. Chris answered all of our questions, and indulged the boys as they asked her all about every little thing in the mill - mostly the parrot that lives in the mill and totally captivated my boys! I cannot take credit for the quality of this yarn - as the fleece was grown while the sheep still lived at their first home - the farm of my good friends and shepherdess mentors Margaret and Linda. But having this first batch of fleeces spun into yarn is giving me a good idea of what to expect with my growing little flock. We have sent some of this yarn to the Kickstarter recipients that supported our fundraiser last year, and the rest of it will become available for sale in Spring 2017. As a long-time knitter and owner of a local yarn store for 6 years, I had never before visited a spinning mill. I found the tour and experience invaluable to really connecting me to what is involved in the process of 'sheep to shawl' I strongly urge any of you that have not had this experience to find a local wool mill and go for a tour. And for those of you who are in Manitoba and Saskatchewan and wish that you had a mill to visit, hang tight, because I am planning to open a wool mill! I wasn't going to say anything on the blog until it was officially going to happen. But I think I would love the feedback, comments, suggestions, and encouragement from all of you, as it's a huge undertaking and I need all the moral support I can get! We are hoping that the mill will be open late 2017/early 2018, but we are still in some early planning stages. I believe that this is such a crucial step in creating a sustainable, local and environmentally sustainable industry. So much of the fleece from Manitoba sheep farmers is shipped to other parts of the world where it is cleaned/carded/manufactured and then shipped back to canada as yarn, insulation, rugs and textiles. How amazing would it be to change that produce our own yarn in our own community! I will share more details with all of you that are following along in the next few months, but in the meantime thanks for your excitement and support of this journey! I'll leave you with one more camel picture - because CAMEL!